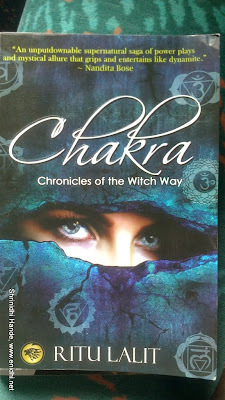 This post is about the recent book I finished reading, titled Chakra- Chronicles of witch way, written by Ritu Lalit. Story revolves around the concept of supernatural powers, and struggle to maintain peace and control among communities having these supernatural powers. Japas and Japnis are believed to be one such key community, living normally among other citizens, trying to live in peace, but series of events force them to go back to their witchy ways, due to enemies who can't be handled in normal way. Book begins with a Japa guru sensing trouble, beginning a homa (fire ritual) in the presence of other leaders and the ritual accidentally triggering a fight among participants, after a heated argument and distrust. It wasn't clear which era the story happens- like few centuries in the past or future. But the mention of cars and guns and phone confirmed that story is happening in current times. Then the story shifts to Delhi, couple of school kids playing a prank of Donkey ride and a series of events unfolding after that. Parineeta (or Nita) is the key character. She has chosen not to use her witchy skills and is living a normal life running a detective agency for a living and takes care of two kids, her brother's children, after his brother and his wife were killed in suspicious manner. Series of events unfold to make her aware of the danger posed to her and her loved ones and the only way to fight back and save the life of hers and her loved ones is to go back to her roots- use the techniques and strengths of supernatural powers. Their enemies are no idiots, who're trying to gain control by killing anyone who's a possible threat to their supremacy. Nita and her nieces are clearly on their target list. With disappearance of Roma, Deep and Sami, their holiday plans at Nainital is put to rest and a series of discoveries and adventure unfolds. Jorawar and Sikka are the other key Japs guiding and helping Nita in the fight. briefing her on her past, the current intel on Japs and their enemies and providing logistics support. The book uses lots of new terms- Bhoomers, Kundalini, Chakra, Pax, Pallavs, Manan, Varunis etc. These are explained on their first occurrence and readers need to memorize them in order to grasp full sense of the story, as the novel unfolds. If you're regular reader of similar stories, it may be easier to you. Adding these key terms as an appendix at the end would have helped some readers. I couldn't understand the logic of Mickey saying he's saved up an amount of Rs 3,41,00,000. Anyways, that doesn't harm the story. In the end the good wins over evil and peace is restored. To know how, read the novel. Overall book makes an interesting read if you like this genre. Ritu Lalit has given us a well woven novel taking care of several intricate details on the subject. Once begun, it is difficult for readers to keep the book away unfinished. Definitely a sequel material.